Made from 100% wool Leather and edge bound real leather. Has piece for badge inside front, with tie cords for adjustment.Quality lining. 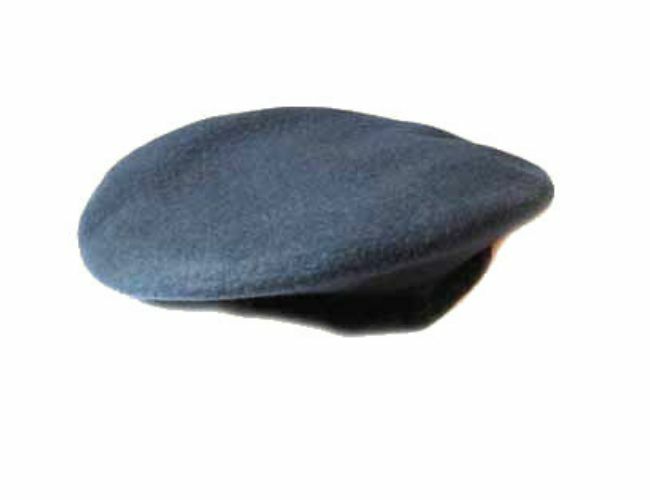 This is a top quality beret and not to be confused with the cheaper models. An average head size for a man is 58 cms in European Sizing or 7 1/8 UK sizing and 7 1/4 US sizing. The average head size for a lady is 55 cms. Probably the largest head size you will ever find, will be 64cms and the smallest 51cms. Head sizes and shapes differ from country to country with the smallest heads being in the Far Eastern countries and the largest in Germany. With regards to shape, these can be either very round or oval, with the far eastern countries having a rounder head and the western countries tending to have a more oval shape. Take a measuring tape and place it around the circumference of the head, slightly above the ears.